Photographing jewelry is an art. Great photographs can sell the work even though the buyer has never seen the real piece. I’ve taken a lot of blah shots so taking better photos is one of my goals. One aspect I’ve begun paying more attention to is the background. Too often I choose whatever is handy or what I’ve used in the past. But not all pieces work well with the same backdrop. Here’s an example. The earrings in these photos are identical, only the background has changed. Which do you prefer? The lefthand photo isn’t bad but it’s too cool and monochromatic for my taste. It looks posed. If the earrings don’t look natural in the photo, would someone still buy them? In the righthand photo the wood adds warmth and colour. It also creates a casual feel, saying these are something you could wear to the farmers’ market, a rodeo or a get-together with pals. Categories: Marketing | Tags: display, photography | Permalink. Well today was a first — I hung my jewelry on a wall. In the Sundre Library to be exact. The display area was started several years ago and has showcased some beautiful local art. As far as I know this is the first time jewelry has been front & centre. It took me quite awhile to figure out how to display the pieces. Putting them on display busts didn’t seem like a good idea. I finally decided to put them into the same display cases I use for transporting pieces to and from a show. However, the cases are too large for one piece, but too small for two. What to do? I eventually settled on one piece and one photo — since the pieces are laid flat, the photo of each one on a bust gives an idea of how it might look when it’s worn. Well-known local landscape artist Virginia Wilson was there to help me set up the display. I was going to stagger the pieces on the wall but she suggested setting them at eye level in a straight line. Looks great, thanks Virginia! 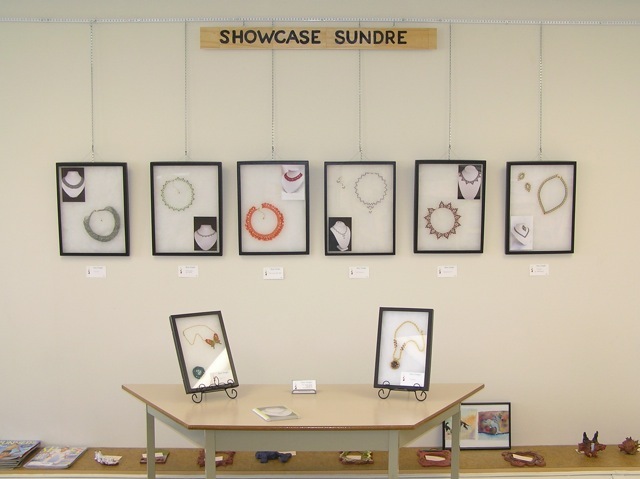 Categories: Events | Tags: art show, beadweaving, display | Permalink.